Yet another sick week for Amber. We've become a little concerned with the near constant stomach and intestinal problems since January. She has been miserable since Sunday and still isn't showing signs of getting well. The pediatrician ran some tests and is sending her on to a GI doctor. That was the main emphasis of our week. Fun. Amber continued school this week, but not at her usual desk and not as much as I planned. Sadly, she still had more lessons than some other non-sick weeks. At least school helped keep her mind off how crummy she feels. Thank goodness we homeschool, otherwise we'd have been forced to make some tough school attendance decisions this week. Amber did manage to attend a couple of her outside activities on Monday, but we quickly found that she didn't have the energy for even one full night of dance. We've been stuck at home since Tuesday except for: a speedy grocery trip by me while Amber had grandparent sitters, a trip for Amber's blood draw, and a single dinner out. 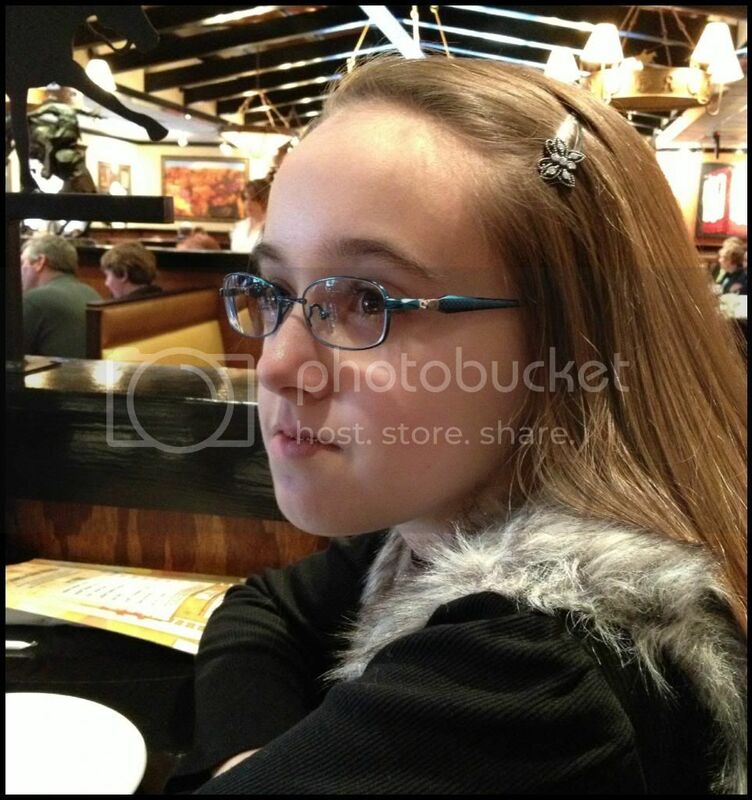 Amber was feeling so cooped up that Wednesday evening we took her to the Outback restaurant a mile away. She felt no worse there than at home and was able to "see the world". She is so melodramatic at times. 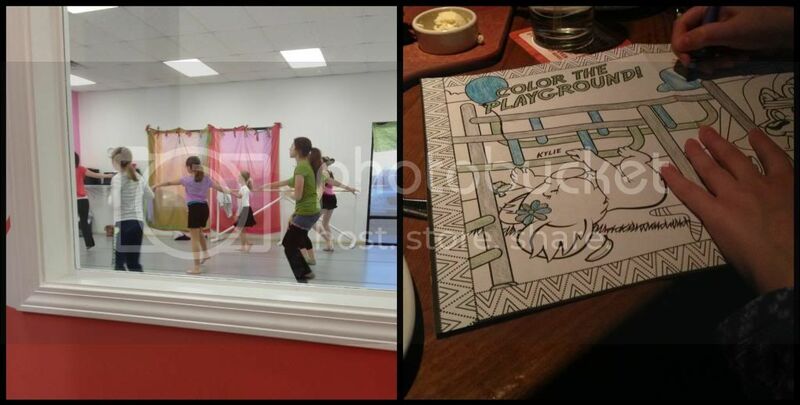 Contemporary dance class and coloring at Outback. At least we were out of the house. This was the first week of fourth quarter and, despite illness, we do have a lot to show for the week - including three completed tests. We officially started World War II in history, and I find my enthusiasm to study this topic waning. Rapidly. I really want to simply download years worth of WWII information from my brain to Amber's. If only it could work that way. I do remember that I had little formal knowledge of WWII at Amber's age, so I guess she won't suffer terribly if this unit is less spectacular than I intended. Amber is currently, this very second, reading Hoodwinked: Deception and Resistance as her introduction to World War II. It looked like a fun way for her to get into the feel of the era while learning specifics about the war. It's also something she can do in her puny, sickly state. We will start the more boring factual portion of WWII next week. I'm still looking for some activities to make it interesting. Religion lessons. We don't mention them much, but I love the Christ Light curriculum we are using this year. Ironically, the winter weather we so craved in winter is here now, when we are studying astronomy. Just our luck. We still haven't managed a single star gazing night nor made it to the planetarium. Hopefully, both will happen in the next couple of weeks, but not this weekend as we already are under a winter storm watch for up to 8 inches of snow. Seriously! I love snow, but could it be any more inconvenient? 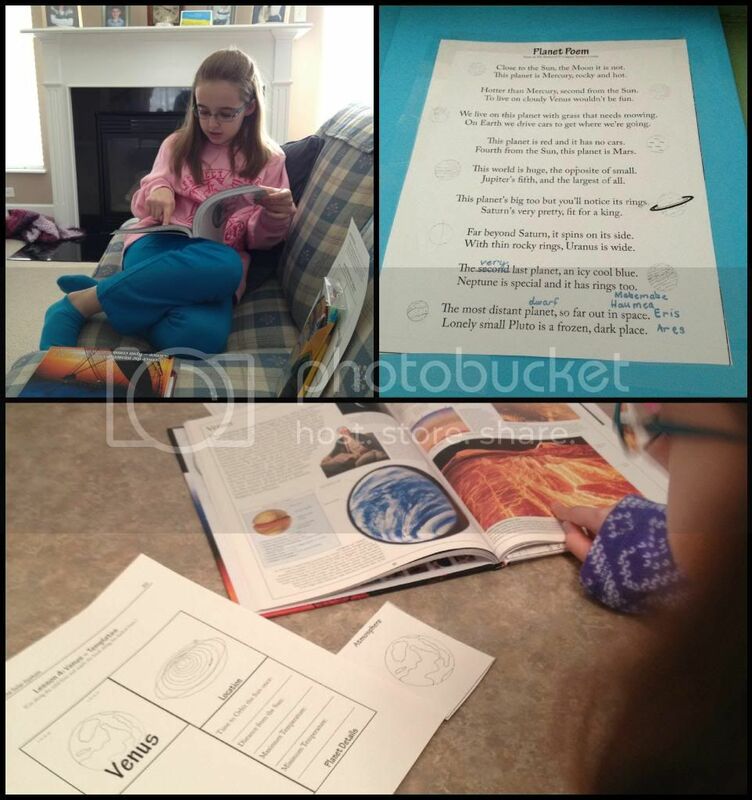 We continued the mix of our regular curriculum and Solar System lapbook curriculum from Elemental Science. Unfortunately, this lapbook is more busy work than fun to Amber. Bummers. I will be writing up a review this week, but I'm pretty sure our issues with the curriculum stem from Amber's previous and extensive study of space. She loves space, so much so that she has been independently researching it for years. Because of her experience, Amber tends to nitpick the details in space books and is easily bored by simple activities that she did long ago. I will say, even though Amber is a bit too much of a stickler, she has a right to her annoyance when the lapbook curriculum waffles between calling Pluto a planet and not. We continue to love Saxon Math and Amber is gliding through it without any problems, even when sick. Recently, I haven't even been able to finish teaching the lessons because Amber stops me and finishes the teacher part. Much of the current content is a step up from another similar concept. Amber had already extrapolated the ideas to the next step on her own and didn't realize we would be covering it again. So, she is a bit frustrated with the current speed of the lessons. At least she doesn't feel rushed. Given all this, I still don't know if she will be moving on to Saxon 8/7 or Algebra 1/2 next year, it all depends on this last quarter of math lessons. The following may seem like a non-sequitur, but lately I have read so much on the different homeschool forums about Saxon math that this topic is on my mind anytime math is mentioned. I never feel comfortable commenting on the boards, so this is my comment to all those forum posts. I know there is a lot of opinions on how to use Saxon and I've dutifully read Art Reed's blog / newsletters on Saxon. I love his insights and they have been extremely helpful to us. However, I still have chosen to grade Amber's daily math assignments, even though it is not recommended. I don't mean I simply correct it, but I give her a grade for the work. 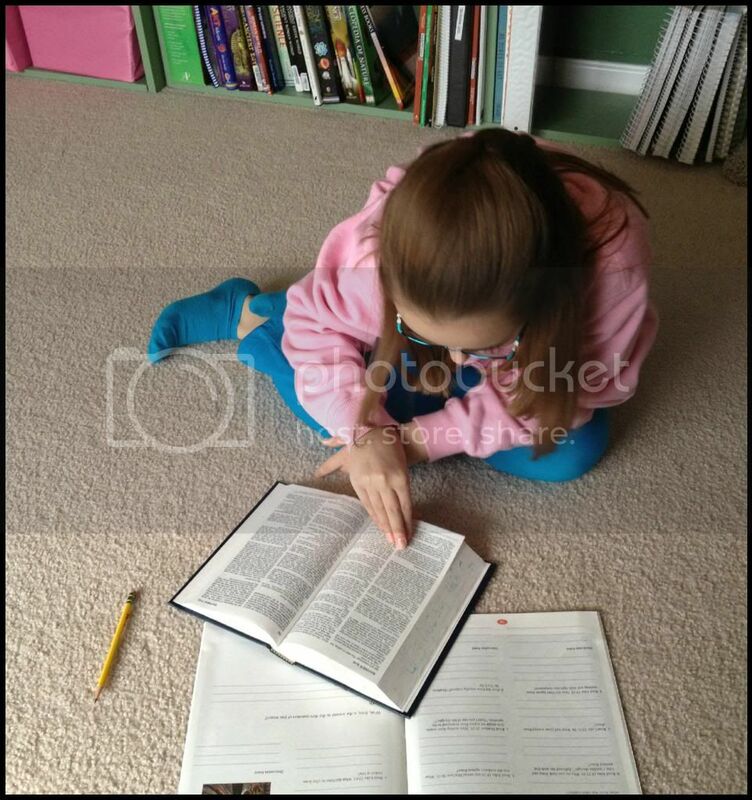 Amber was accustomed to this practice in her parochial school, so it is not something new I've instigated. While it causes her stress to receive a grade when she didn't put forth as much effort as needed on a particular daily assignment, it does make her feel better that her entire math grade is not solely the 23 tests (20-points each). Basing a grade on only tests is just asking for full blown test anxiety right there. I know, I've had it (er, still do, I guess. Just haven't been tested recently). However, I do weight Amber's grades, with tests being worth 45%, instead of using a simple averaged point system. That was my little Saxon Math confession. I grade her daily homework and feel that it is appropriate, even after reading all the recommendations by the professionals. I'm such a guidelines breaker, who knows what I might do next? At lunch Sunday (pre-yucky feeling). She's distracted and dreaming about her Monday math lessons. Or... she might have been watching a TV in the bar at Longhorn. I'm going with the Math dream, myself. In literature, we finally finished Robin Hood! It was fun, but took a little bit too long for my taste. We used a Memoria Press study guide for the book, but unfortunately didn't utilize most of the resources it provided. I will probably skip their study guides in the future because the cost doesn't justify the amount of use it will get. The comprehension and vocabulary sections were useful and appropriate, just not worth the cost. Since reading was something Amber could easily do this week, we have made great progress in the next literature selection, Treasure Island. At first Amber had some difficulty with the wording, simply because she didn't know what many of the words meant. She told me it seemed very "old timey" in speech. Now that Amber is through the third section of the book, she is more comfortable with the vocabulary and characters' speech patterns which is allowing her to retain more details about the story. I hope we can watch a version of Treasure Island when she is done reading, however, I still need to select a version to watch. This is how she looked most of the week. She even had me put up the air-mattress so she could sleep in my room too. That's a fairly broad summary of our week, but it really was a lot of sitting, reading, math work and napping. There is still a specific other-than-school stress that is happening here, and I'll eventually get around to discussing it. Right now, just thinking about nearly gives me a panic attack, and I'm forced to think about it almost daily. Sigh, just one of those things. Have a good weekend, and bring on the late March snow! Oh, Amber. :( Wonder why her belly is hurting? Do you think she might have an ulcer? I know my SPD kid is so tense and anxious most of the time that I wouldn't be surprised if he someday develops one. I try very hard to make the "world" comfortable for him, but life happens. I hope they figure out what's going on so she feels better! Do what YOU feel is right and works for Amber when it comes to Saxon (or any subject). We correct here, but not for grades until high school (when I have do put grades on transcript)...anything incorrect is reviewed and reworked until correct. It comes down to what YOU want to do. Have you seen the Cliff Notes Literature Notes for lit study guides? I have the link under "Favorite Resources". It's a great way to get some insight into different books...and its free. Oh dear, I do hope that you get to the bottom of Amber's health issue and that she feels better soon! Poor Amber! I've had similar thought of "Thank you, God, that we homeschool and don't have to decide it send or not to send." I also love being able to keep sick brains occupied. 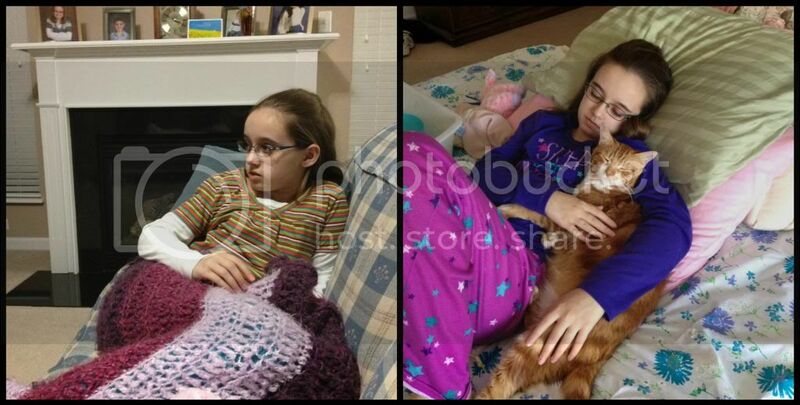 It seems my girls are crankier if the don't have something to challenge their brains when sick. SO I always adjust for sick days, but also always make sure they are doing some school. That helps everyone's sanity!